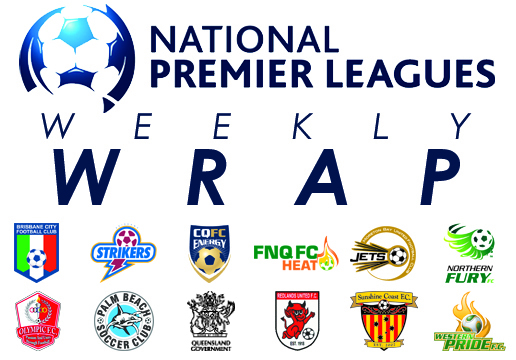 The NPL Queensland finals picture is starting to take shape with six rounds remaining as Palm Beach Sharks drop out of the top four race and Fury keep their hopes alive with a second straight away win. Brisbane City extended their undefeated streak to an NPL Queensland record thirteen games on Friday night following a hard fought 1-0 win over fellow finals contenders Moreton Bay Jets at Spencer Park. A late goal from second half substitute Eric Frazier proved decisive for the hosts in the sometimes scrappy contest that saw both defences organise well to stifle their opponents attacking threats. City’s Japanese defender Yoshi Sakurai pushed forward to create the chance late in the match, teeing up Frazier for a neat near post finish on 15 yards with ten minutes remaining. The goal is the American winger’s eighth in his last seven apperances and 12th of the campaign thus far. 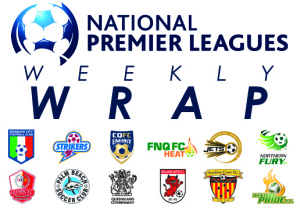 The win lifts City, who still have a game in hand, to second on the NPL Queensland table and eight points shy of league leaders and cross town rivals Olympic FC. City’s 13 game unbeaten streak bests Olympic’s 12 game run earlier in the season which was halted by City in a 3-1 win at Goodwin Park in early June. Northern Fury continued their tilt at a NPL top four finish with a comprehensive 3-0 win over bottom-placed Queensland Academy of Sport on Saturday afternoon at Perry Park. Second half goals to Michael Eisenhut and Reyze Kelly sealed the result for the Townsville-based Fury after Mitch Robinson gave them an early lead when he headed home at the far post in only the second minute of the contest. The first half saw both sides spurn chances before Fury extended the lead shortly after the restart when Eisenhut showed quick-thinking and quick-feet to gain possession in the final third before slotting home a well-taken shot. Kelly, who took the captain’s arm band following the mid-week departure of regular skipper Jared Stanley, spectacularly sealed the points with 13 minutes remaining, looping a volleyed shot into the goal with the outside of his boot from 20 yards. The win is Fury’s second in the south-east corner of the state in as many weeks and alleviates doubts concerning the club’s away form as the home and away season draws to a close. Fury are nine points adrift of the NPL top four with five games remaining and will need to rely on other results if they are to qualify for the finals. QAS remain fixed to the bottom of the table with one win and two draws from their 16 appearances this season. Redlands United’s title ambitions are all but dusted after the bayside club dropped a vital three points and saw three players dismissed in a 3-1 defeat at the hands of Western Pride on Saturday evening at Cleveland Showgrounds. Goals to Pride striker Peter Drager, Will Jordan and goalkeeper Steve Purdy from the penalty spot proved decisive for Pride in the final wash-up, however it was the dismissals of Cameron Draper, Scott Bow and Haydyn Eames that garnered the headlines as Redlands fell to only their fourth defeat of the season. Goalkeeper Purdy opened accounts from the penalty spot for Pride on 55 minutes, converting after Drager was brought down by Eames. Purdy’s goal is the first from a goalkeeper in NPL Queensland this season and makes him only the fifth goal scorer for Pride this campaign. A minute later Draper was giving his marching orders after felling Drager at the top of the box in a clumsy one-on-one challenge. Redlands pulled one back courtesy of wily attacker Jheison Macuace, who finished off some impressive build-up play from the then ten-man Devils to fire home from the top of the area. Drager restored Pride’s advantage with 15 minutes remaining, the striker slipping in behind the Redlands line before slotting a composed finish past Redlands custodian Mitch O’Brien. Drager then capped off a game-changing performance when he accelerated past the Redlands defence then squared a pass to Jordan for the final goal of the night. With the result all but sealed, Redlands’ frustrations got the best of them in the final ten minutes – Scott Bow dismissed for a second bookable offence before Eames was shown a straight red following a confrontation with a vocal group of supporters. The win lifts Pride to eighth on the NPL Queensland table, ahead of Palm Beach Sharks on goal difference. Meanwhile, Redlands drop to third and find themselves 11 points adrift of top spot with only six regular season games remaining. Fifth-placed Brisbane Strikers have put their fellow NPL Queensland finals contenders on notice following an emphatic 8-1 win over lower table strugglers CQFC Energy at Perry Park on Saturday night. English midfielder Clark Bradford, winger Jonti Richter and young striker Josh McVey netted doubles against a hapless Energy side, who didn’t help their cause by conceding an own goal in each half. Bradford opened accounts in only the second minute for the hosts, toe-poking past Energy goalkeeper Tim English from 15 yards. An own goal 16 minutes later from a contested header doubled the Strikers lead at the half time break. A quick-fire double from Richter at the start of the second half started the blow out – the winger’s first a curling cross-turned-shot from a 20 yard free kick that snuck in at the back post, the second a lunging effort to turn in Alistair Quinn’s low cross six minutes later. Striker McVey found two goals of his own in quick time shortly after – controlling Greg King’s pass with his chest before coolly slotting his low shot past English, then firing home from the top of a crowded penalty box for his seventh of the season six minuets later. Bradford secured his third goal in two weeks with a delightful fifteen yard chip with 13 minutes remaining on the clock. Sander Waterland restored some respectability for the visitors when he combined on the counter attack with striker Chris Geddes in the final ten minutes, however another own goal shortly after restored Strikers seven goal margin. The win is the second consecutive three points for Strikers and keeps David Large’s side one point outside the NPL top four. Meanwhile, Energy remain mired in second last only two points ahead of cellar dwellars Queensland Academy of Sport. Sunshine Coast Fire have ended Palm Beach Sharks hopes of a NPL Queensland finals berth after defeating their coastal rivals 4-0 at an overcast Sunshine Coast Stadium on Sunday afternoon. A four goal second half blitz from the Fire, including a double to recently returned youngster Dylan Firth, turned the game on its head after an evenly contested opening forty-five minutes. Leon Dwyer scored the opener for the hosts six minutes after the restart, finishing off Nico Bechar’s cross with a regulation first-time finish on the edge of the six yard box. Dwyer then returned the favour eight minutes later when his well-weighted pass picked out Bechar, who finished calmly to slot the ball into the bottom corner. Not long after, Firth netted his first since returning from Victorian Premier League club Hume City, drilling home a well-struck left-footed effort from 16 yards. The 19 year old completed his brace with six minutes remaining after last week’s two goal hero Michael Scarff teed up the youngster inside the penalty area. The win keeps Fire in fourth place on the NPL Queensland table and is the third consecutive clean sheet for Kevin Aherne-Evans’ side, who continue to boast the best defensive record in the competition with only 17 goals against this season. Olympic FC put a troubled week behind them as they recorded an impressive 4-2 win over FNQ FC Heat at Goodwin Park on Sunday afternoon. The hosts were unfazed by the absence of three first team regulars as they overcame a spirited Heat outfit, Tim Smits recording a brace to storm to the top of the NPL Queensland goal scoring charts with 21 goals for the season. First half substitute David Bowater opened accounts for Olympic in only his fifth appearance of the season, the midfielder doing well to free himself ahead of a defender to poke home from Jai Ingham’s cross on 27 minutes for his first score of the season. Cameron Morrison levelled terms for Heat on a breakaway seven minutes later – Olympic goalkeeper Matt Lugo saved the initial shot from Heat skipper Alex Plowman before Morrison headed home at the far post after the visitors regathered possession. Olympic replied inside a minute courtesy of the in-form Smits, who volleyed home from the edge of the area. Winger Ingham then shaked his defender and unleashed a sharp lower corner finish to score for the fifth straight week on the stroke of half time. Smits completed his double just after the hour, turning at the top of the area and cracking a well-struck shot to the right of Heat custodian Jack Richards; the goal lifting Smits past City striker Antonio Murray as the league’s top marksman. Heat threatened a late comeback after Tom Murphy beat Lugo to a deflection off the post to reduce the margin to two goals, however Olympic held firm to maintain their eight point advantage atop of the league standings.